During last week (29 – 31 May) Nicolas and I made a quick journey to Spain, to Catalonia for a meeting to organise the next CIIR (International Interconfessional Conference of Religious) which will take place in June next year. The organising meeting was uneventful and with Nicolas chairing we didn’t hang around! 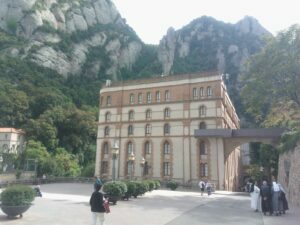 This is very good, especially because we were meeting at Santa Maria de Montserrat, the Benedictine monastery in the Catalan Hills. Set high up on the mountain edge there has been a place of worship at Montserrat since the C11, and the current Abbey has seen major restoration work in the C19 & C20, and alterations made to the buildings to care for the crowds of people. Just over two million people each year make a journey up the mountain to visit Our Lady of Montserrat. Even though it is crowded during the day, there is a wonderful atmosphere on the mountain edge. It is one of those places where the economy of life seems more balanced: our primary vocation of praise, glory, worship and dedication to God is there at the centre of mountain life. Whether your heart is uplifted by the sound of the L’Escolania, the famous Boys’ Choir of Montserrat, or you are reduced to silence by the awe-inspiring views, I cannot see how people could leave that place without, in the smallest of ways, brushing up against the living God. People come from all over the world to pray at the shrine of Our Lady, but there is no easy way up the mountain: you can walk, drive, cable-car or funicular your way up the hillside. 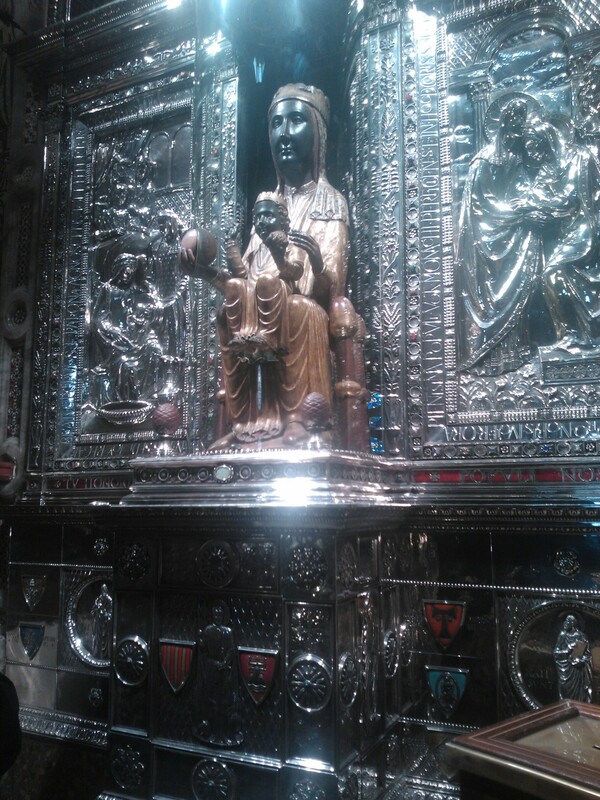 Many lamps burn around the little Basilica, one even for FC Barcelona, who I’m told are better than our own Huddersfield Town, though I can’t imagine that is possible. High up, at the east end of the Basilica, Blessed Mary is seated with the Christ child, reassuring us of God’s maternal care, turning our hearts and lives towards the mystery of love found in Her beloved Son. All the time the Abbey is open pilgrims and sight-seers make their way through the painted corridors of the Basilica to touch and venerate the kindly image that opens our hearts and imaginations to the story of Salvation. We were made very welcome by the Abbot and the Community, and were able to join them in Quire, and for the Offices (when the Basilica is closed). Visitors join the 50 or so monks for worship (if you are staying in the Hotel, you can even watch a live-stream from the Basilica on the TV in your room!) and, unlike Mirfield, there is little interaction with the Community; the Monastery and the School each live very separate lives. 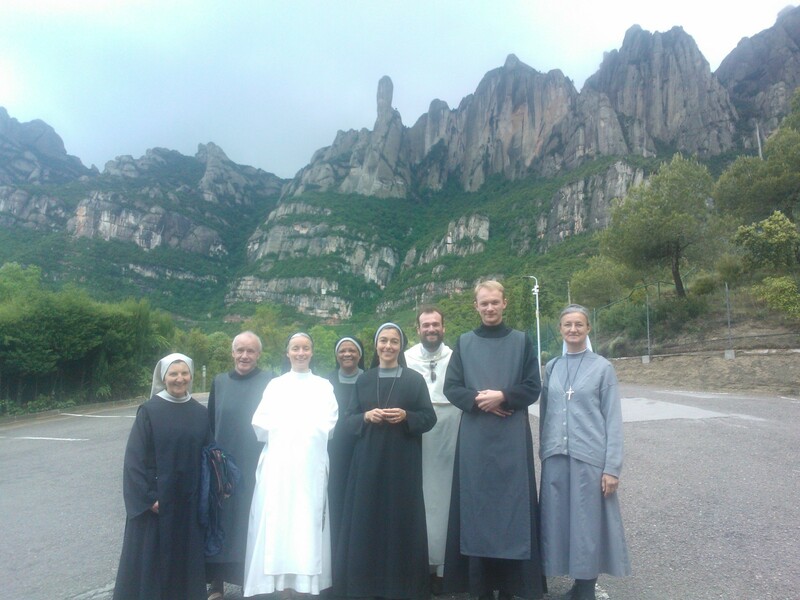 During this visit we met with the Abbess and Sisters of the monastery of Sant Benet de Montserrat, a Community of enclosed Sisters who also live on the mountain, but away from the hustle and bustle of the shrine. The Sisters made us very welcome and we were treated to a tour of their pottery workshop. It was wonderful to meet with my Religious Sisters and Brothers from CIIR in such a holy place, and I am very grateful to have been asked to make the journey.